Of all the Seven Wonders of the World, only the Great Pyramid at Giza remains today. Like the other pyramids of Egypt (discussed in the previous chapter), the Great Pyramid continues to confound Egyptologists, who are at a loss to explain the method and purpose of its construction. Only a short camel ride from the modern city of Cairo, this ancient wonder stands, the Pièce de résistance in a complex of structures consisting of three magnificent pyramids, a colossal sphinx, several lesser pyramids and a few tombs. 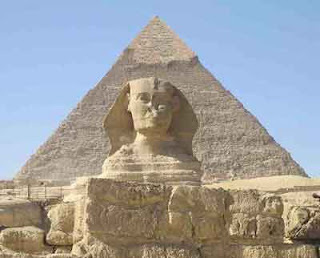 The largest pyramid is referred to as the Great Pyramid or the Pyramid of Cheops, Cheops being the Greek form of Khufu, the name of the Pharaoh who was the son and successor of Seneferu’s throne. The Great Pyramid has become the apogee of pyramid building with respect to size and quality. Scores of attempts have been made to illustrate its size by comparing it with other famous structures. Originally it is thought to have been 481.4 feet high; the centuries have erroded it to its present height of 450 feet. It covers 13.1 acres and its side measurements, according to I. E. S. Edwards in The Pyramids of Egypt, at the base, have been surveyed as follows: east, 755.88 feet; west, 755.77 feet; north, 755.43 feet; south, 756.08 feet. Although no two sides are absolutely identical in length, the difference between the shortest and longest side is only 7.9 inches. Its four triangular faces incline at an angle of approximately 51 degrees, 52 minutes to the ground. The entire structure was originally oriented in line with true north and south. One of the mysteries of the Great Pyramid at this point is that many archaeologists and explorers have surveyed it and gotten different measurements of its height. One source quotes it as 484 feet, another claims it to be 499 feet high. Some say its base is 756 feet square, others assert that it is 693 feet and that the triangular faces slope at an angle of 51 degrees, 19 minutes, 14 seconds. Presently its true north-south orientation contains the following estimated errors: northside 2'28" south of west; south- side 1'57" south of west; eastside 5'30" west of north; westside 2'30" west of north. The accuracy of this orientation implies that the four corners were almost perfect right angles with their exact measurements being: northwest 89° 59'58"; northeast 90° 3'2"; southwest 90° 0'33"; southeast 89° 56'27". Do The Pyramids Show Continental Drift? Abstract. The mystery of the orientation of the Great Pyramids of Giza has remained unexplained for many decades. The general alignment is 4 minutes west of north. It is argued that this is not a builders’ error but is caused by movement over the centimes. Modem theories of continental drift do not predict quite such large movements, but other causes of polar wandering give even smaller shifts. Thus, continental drift is the most likely explanation, although somewhat implausible, especially as relevant measurements have been made over a 50-year period, whereas geophysical measurements of sea-floor spreading relate to million-year time scales. Giza is situated approximately 30°E, 30°N; hence, we can say that the pole of about 4500 years ago (as seen from the center of the earth) is now 3.5' ± 0.9' along longitude 60°W toward Greenland, and with an unknown component along longitude 30°E. At the time of building, the “pole star” would have been Vega. Being at an elevation of 30°, Vega would be ideal for alignment, but it would be worthwhile to conduct an experiment on the actual site so that all possible sources of error could be investigated. It is now well documented that the true pole moves at 0.0032" annually along longitude 60°W (3). This would amount to 0.24' over 4500 years, which is far too small, and is of the wrong sign. Some variation is thought to be caused by the melting of the ice on Greenland and Antarctica. Other variations of the polar position are oscillatory in nature and are of very small amplitude (4). Continental drift can cause the direction of 64 true north to vary with respect to the moving block. The Americas have been separating from Africa and Europe owing to the spreading of the sea floor. This movement has a hinge southwest of Iceland, and is about 5 cm per year between South America and Africa. If this causes only the latter to rotate and if the rotation is uniform, in 4500 years the pyramids would be rotated 0.1' in the observed sense.